Heading out to Las Vegas recently for the International Builders’ Show (IBS), I was struck by a sense of excitement in the air. Nothing scientific, nothing concrete, I could just feel the mood of the travelers was a bit lighter, the airport was a bit more crowded and the hotel was definitely busier than this time last year. Thankfully, the dreary weather we experienced during our week there was not indicative of the mood of the builders who attended. When you look at the numbers, you wouldn’t necessarily think things were looking up. Attendance was down from last year, from 60,000 a year ago to 55,000. The number of exhibitors was down about 30 percent also. However, our leads were up 30 percent over last year and were just shy of the number we hit in 2007. I have a couple of theories about why. The NAHB made an excellent decision to shut down one of the exhibit halls and condensing the 1,100 exhibitors into two halls. This made the traffic much denser. However, while density gives you volume through the aisles, it doesn’t necessarily translate into leads. So what was it? Solar. It may have been raining and cold outside, but the interest and “energy” around solar and photovoltaics was definitely there. Now, the fact that we introduced our new Energen Photovoltaic Roofing product (available this spring) at the show may have helped substantially in our lead count, however, you could see immense interest in this area. We weren’t the only ones talking about it, but it was obvious that the crowds were drawn to what is becoming more and more of a hot-button topic in the green/sustainable movement. It’s nice to see that manufacturers (ourselves included) aren’t shrinking and running for cover during the downturn. When sales are down, innovate and ready yourself for the upturn; that seems to be what some in the industry are doing! Energy efficiency is the name of the game these days. Look at our friends at Hearthstone Homes in Omaha, Nebraska who are focused on energy efficient home construction . They’re doing innovative work like using 2 x 6 framing and guaranteeing energy bills to their buyers…or they pay the difference! Builders like Hearthstone are getting serious about not only building quality, but adding real, tangible value to the homes. We’re excited to be entering the solar frontier and proud to partner with folks like Hearthstone. The industry’s heating up and in the end, the homeowner wins. Mike Loughery is Director, Corporate Marketing Communications at CertainTeed Corporation. We’re starting to respond more and more to energy efficient request for our kitchen and bathroom remodeler projects. It’s been pretty interesting finding research and articles covering this very topic. I was at the IBS! good times. You guys had a great booth! Solar energy is one of the greatest ways to conserve energy and conserve cash. 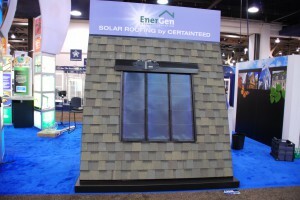 No Gambling In Las Vegas roofing solar energy reduce energy costs contributes to a cleaner environment. you have a great blog here at https://www.blog.certainteed.com! Thank you for posting this nice blog.